More than 550 miles in total, the natural gas pipeline will run for 150 miles in eastern North Carolina. It will start in West Virginia, pass through Virginia, enter North Carolina in Northampton County and end in Robeson County. At an estimated cost of $4.5 billion to $5 billion, the controversial pipeline ranks No. 20 in the 50 top projects. The natural gas, produced by fracking in West Virginia, will not necessarily serve North Carolina, while posing environmental, health and safety risks and loss of property values for nearby residents, most of whom are low-income and minorities. 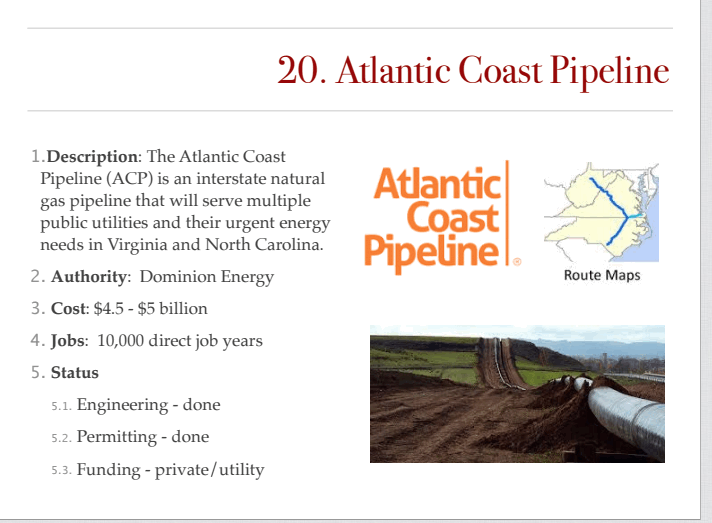 Clean Water for North Carolina and other environmental groups oppose the pipeline not only on social justice grounds, but also for economic reasons. It will create only 18 permanent jobs in North Carolina. The Trump administration lists the employment figure for the entire pipeline as 10,000 “job years.” A job year is different than a job: If a job lasts 12 months, that’s equivalent to one job year. The source of the figure is not explained. The pipeline must be approved by the Federal Energy Regulatory Commission. FERC is holding three hearings next month to take comment on its draft environmental impact statement. However, Hope Taylor, executive director of Clean Water for North Carolina, said that these will not be traditional public hearings. Instead of accepting comments in public, FERC staff will take individual comments in a one-on-one setting. This is problematic in that people can’t hear others’ comments; nor can the media easily report on the hearing unless reporters are allowed to accompany each individual as he or she talks to FERC staff. Fayetteville: Monday, Feb. 13, 5-9 p.m., Doubletree Hotel, 1965 Cedar Creek Road. Wilson: Tuesday, Feb. 14, 5-9 p.m., Forest Hills Middle School, 1210 Forest Hills Road. Roanoke Rapids: Wednesday, Feb. 15, 5–9 p.m., Hilton Garden Inn, 111 Carolina Crossroads Parkway. Notice that the project list states that all the permitting for the ACP is complete … Really? Could pointing out that permitting has a long way to go take the ACP off the list?